Amazing that our victory comes from the most tragic event in human history! Thank you for the sweet reminder of what our Savior endured so that we might have life, hope and peace! Wow! That was a quick response! Thanks so much, sweetie! I am always so honored to have you visit…and comment! You always bless me. May you have a very blessed Easter! Love you! 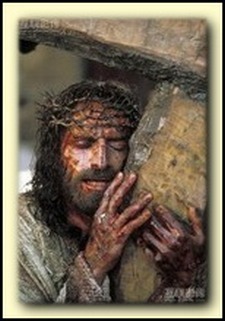 You made me cry … Lynn, you have such a way of putting “flesh” to the image we have of Jesus. I never would have thought of Jesus smelling wood. Why do we “spiritualize” Him so? He was a real man, and he suffered real pain and separation from the Father … for us. I’ve been following the daily messages (on The Incomparable Christ) at reviveourhearts.com. I has also helped to focus my thoughts…. I highly recommend it to you and your readers. Thanks again for the reminder, dear Sister-Girlfriend, that Jesus’ death was personal to Him and personal for us. God bless you as you continue to focus on Jesus during this season. Oh, Dawn, you have so blessed me that I’m in tears! You have truly encouraged me. Thank you so much for your kind words. And thank you for the site. Going to check it out. Blessings to you for a special Easter. Lynn, this is very eloquent. Thank you. Thank you so much, Terra. So good to have you visit. Hope all is well with you. Hope you have a blessed Easter! Beautifully written. I’m gonna share this one on Facebook. You have such a gift. Beautiful, Lynn! Never thought about the thoughts the scent of the wood may have evoked in our Saviour. Thanks for this poignant post. Have a blessed Easter! Again, personal, beautiful imagery. I hand not thought of the sensory triggers. Wonderfully done, thanks for sharing, Lynn. This is great. Comparisons always make a deeper impression and the Bible is filled with them–an example for us to follow. Thanks for sharing this one! Linda, thank you so much for your comment and for sharing it. You have made my heart happy! Bless you! Maria, since scent is the main trigger of memories, I’m sure all that happened to Jesus opened the door to all those memories. Thank you for visiting and commenting. I deeply appreciate it. Blessings to you! Hey, dear Lorrie! I’ve missed you. Thanks so much, sweetie! Love you! Thank you, Ceci. You make my heart happy! You’re a sweetheart! Bless you! Sheila, thank you, dear one. I deeply appreciate your comment. Bless you! Graphic. Sobering. Well written. It stirs our imaginations about what was done, and our appreciation for it being done. Good post. God speaks to you in such a special way, Lynn, and has given you a great gift of writing. I was unable to make it to the service tonight, but your post has touched me as much as any sermon could have. Blessings to you, my sweet friend. Thank you so much, Warren. Your words are always an encouragement. Bless you! Oh, sweet Connie! I’m so honored by your generous words. Thank you so much! You make my heart very happy. Blessings to you! My dad was a carpenter. I grew up with the scent shaved wood and sawdust. This brings back memories as well. Oh, my! Sandra, that so touches my heart. Thank you so much. Easter blessings to you, dear one! You paint a picture that is indelible. I’m constantly amazed at God’s sovereignty. I can actually picture this scene and it is breath-taking. Wow! You bless me, Dean. I’m humbled by your kind words. Thank you so much! Blessings to you! ← Who Removed the Nails? ← Woman, Why Do You Weep?